Russian President Vladimir Putin has said Moscow’s ties with Beijing are expected to be a considerable factor in global politics. Russia-China ties “will significantly affect the contemporary architecture of international relations,” said the president. 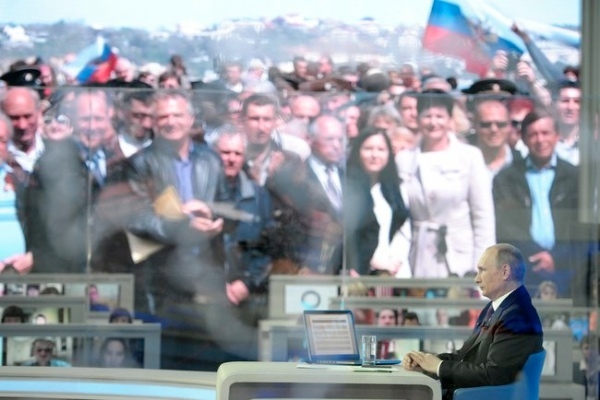 The Russian President was addressing a direct line broadcast into Russian homes. Putin vowed to expand cooperation with “trusted ally” China ahead of a critical visit to Shanghai next month where he is scheduled to meet his Chinese counterpart Xi Jinping. “We’ll develop relations with China. We’ve never had such trusted relations,” Putin said. “Cooperation with China, including that in international issues, is at unprecedented level,” he added. He asserted that Moscow and Beijing have common views on the international situation and global security issues. With joint exercises on land and at sea held within their borders, military mutual trust has also been strengthened, Putin said. In 2012, Putin included China in his first foreign trip after assuming the Russian presidency. Xi Jinping also chose Moscow as his first state visit as China’s head of state. this is the new driving force for the new world economic / financial and political order. May 2014 will be a critical juncture. Victor , why is May 14 -2014 a critical juncture on this issue ? I think Victor is pointing to an expected agreement between Russia and China concerning a major long term sale of gas from Russia to China. The agreement which has been in the pipeline for the last ten years is said to become public in May. There are still many obstacles to this agreement. The first one being that China is able to buy gas from anywhere at the best price (gas is not in short supply globally). On the other hand Russia can’t sell gas to the current market price because its costs of production are much higher. Therefore if there will be an agreement it would be seen in US and EU as de facto economical support of Russia and its current politics in Ukraine. The other obstacle is the cold fact that China is trading a lot more with US and EU than with Russia. Many analysts think China is politically far too prudent to undertake some relatively short sighted moves that would undermine its long term economic relations with US and EU. I believe China very soon will not care one iota what the us or eu think. They are positioning themselves to be the financial power and propel their currency to be the reserve. Look at how cautious they are in everything they are accomplishing. The usa is running around throwing its military across the world being a bully because it knows its days are numbered. We are in for a major shift and I believe it will be in less than 10 years unless the usa brings all nations to war.